Victraders has more than doubled its readership over 2017 and we want to thank all our readers and all those who have contributed to our articles throughout the year. 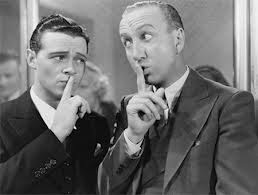 We know that we don't always publish views or news that please everybody but your willingness to agree, argue, express views, and sometimes thump the table, makes every debate that much richer. 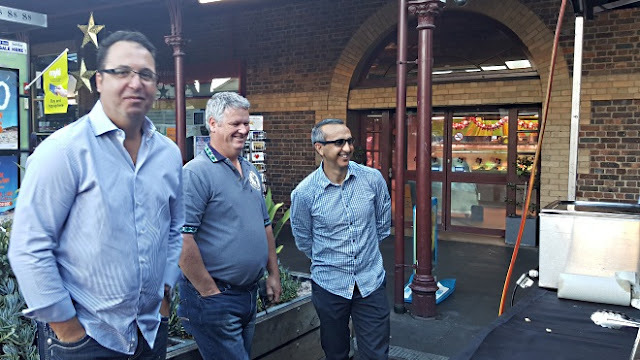 The Queen Victoria Market is a great place and millions of people around the world expect us as custodians to make it as good as it can possibly be. 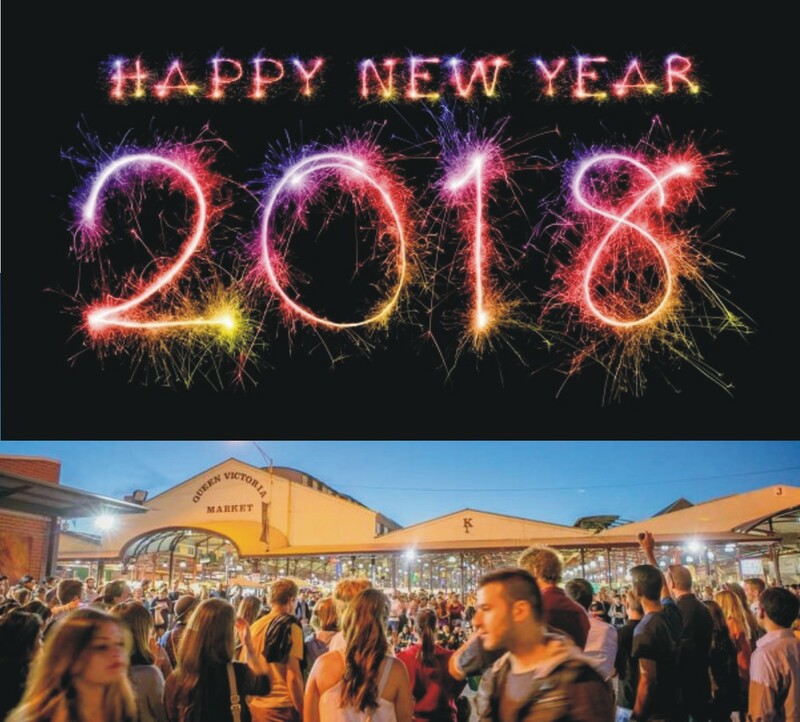 Here's to a great 2018. Crowds At Last – History tells us that post Christmas trading in Specialty Merchandise can be better than pre-Christmas trading and this week’s trade has pleased many. Crowds in the Upper Market on Thursday, Friday and Saturday were reported to be above recent averages with a number of traders reporting good sales. The fickle nature of retailing means that not every trader has benefited in sales although all seem to agree that the buzz is very welcome. Will It Last? – the burning question now is how long will the crowds last and will we get a meaningful boost to sales. A trader said he hoped it would extend past the Australian Open Tennis. 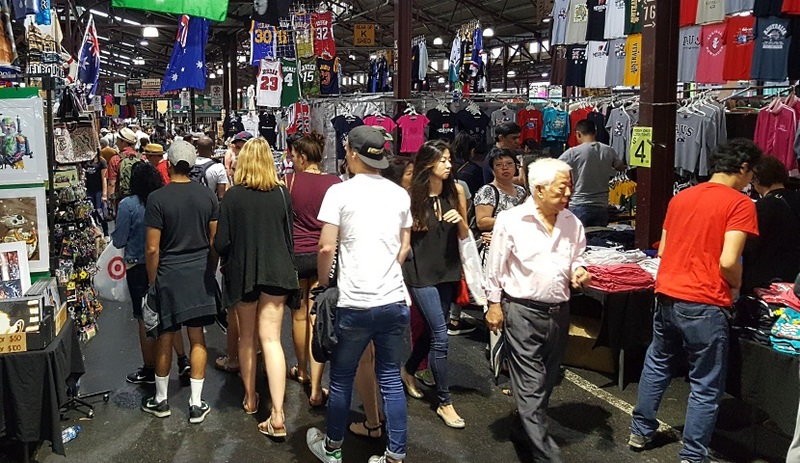 One Trader said that he had almost forgotten what it was like to get a strong buyer reaction with large numbers of international and interstate tourists in the market. Friday was his best trading day of the year. 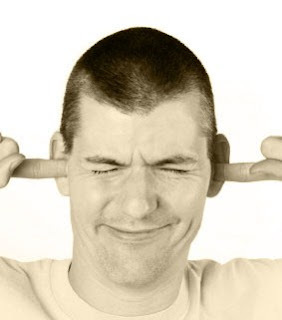 A Moment of Silliness – One trader decided to leave the market before the extended closing time on Friday and had to beep the horn on his van as he drove up the aisle to warn the thousands of shoppers in RK/RL who were still actively buying. His neighbours were understandably perplexed and annoyed. As one market person said – “Where I come from you get praise for considering others but there are consequences for behaving badly”. 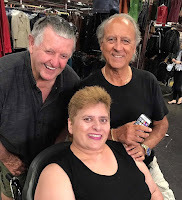 Hello Xenia – Trader Xenia who suffered a stroke at the market some 16 months ago was a surprise visitor on Saturday and warmly welcomed by traders as she progresses with recovery. Goodbye Kha – one of our long term traders, past Trader Representative, and absolute gentleman, Kha Nguyen, will be leaving his stall this weekend. We wish him every success for the future. Stall Changes – we understand that the recent instances of stall sales are all reaching conclusion with papers signed or about to be signed. City of Melbourne have announced plans to accommodate a flagship store for Apple on the Federation Square site as part of upgrading and maintaining the Square’s relevance to Melbourne and its visitors. Oroton Saved – one of Oroton’s major shareholders, Will Vicars, has purchased the ailing retailer from administrators. Conglomerate Scandal Could Impact Australian Businesses – South African conglomerate Steinhoff, has been embroiled in a corporate scandal that resulted in wiping 90% off the company’s share price and could impact on its Australian operations. Steinhoff operate brands like Freedom Furniture, Fantastic Furniture, Harris Scarfe and Snooze. The Australian arm has sought advice from company administration specialists on how it might respond. 1. H&M plan more store closures as they look to e-commerce. 2. Australia Post sets record for parcel deliveries this Christmas. 3. Unilever to offload spread brands, Flora, Pro-activ, as it repositions. 4. Chadstone Shopping Centre to get new $130m luxury hotel. 5. Gold Coast gourmet pizza bar to add wine to delivery list. 6. 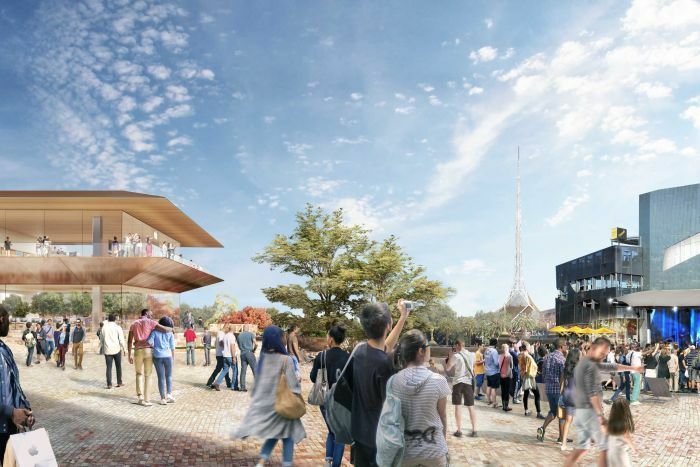 Fed Square to get first Apple Store in southern hemisphere. 7. Kaufland quits online retailing. 8. Retail Food Group shares continue to plummet. 9. Kraft Heinz to drop caged eggs globally. These are some of the interesting articles that came across our desk this week. If anything catches your fancy, just click on the link. THE Queen Victoria Market will be the number one shopping spot for fresh produce and seafood on Christmas Eve as families begin preparing their festive feast. Tens of thousands are expected to come from suburbs across the state to pick up their favourite fruit and veg, and tasty crustaceans. Is This The New Munro's? We understand this is the latest graphic from construction company, PDG, on how a Munro's building might look adjacent to the market. What Is Really Intended for QVM? 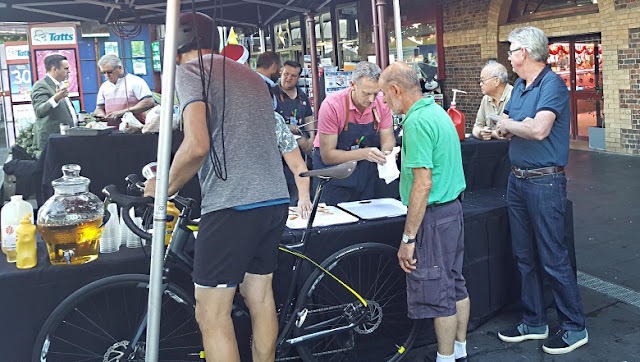 The variety of extreme opinions about the real intent of the City of Melbourne for QVM’s future is mirrored around the world as people mysteriously pick unlikely explanations for a variety of events. 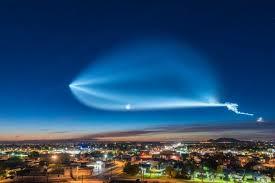 The picture here shows a night event in Californian skies recently which understandably drew a lot of interest and caused Elon Musk to sarcastically tweet that it could be “a nuclear alien UFO from North Korea”. We can assume he was sick of irrational opinions dogging politics and technological innovations in recent times. In fact the vision was of Musk’s Space X Falcon 9 rocket launch which was delivering 24 satellites into earth orbit. Of all the explanations for the night event that was the most likely but not nearly as exciting as the threat of aliens, nuclear warheads, or attack by North Korea. 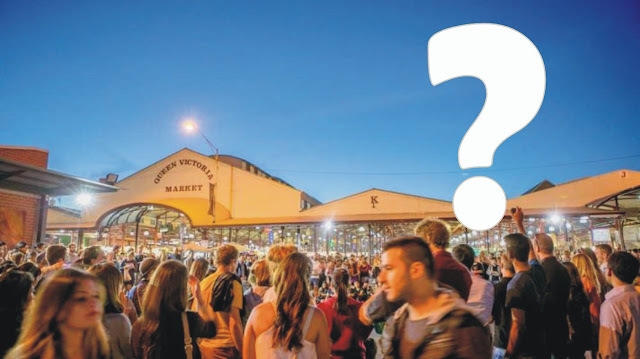 Some 6 years ago the City of Melbourne declared that it was going to invest up to $250m in the Queen Victoria Market to ensure that it didn’t track the decline of many overseas markets. After years of taking income from the market it was decided that the market needed investment in basics like power, running water, and logistical support. Essentially it needed to be brought up to scratch so that it could be relevant to Melbourne’s landscape for another 140 years. The city even changed the status of the market to guarantee public use for perpetuity and launched a campaign for World Heritage listing. That was a perfectly reasonable and likely intent for a city that wanted to keep a traditional open air market as part of its city landscape. But that likely explanation didn’t stop the sceptics from announcing that the City had other intentions. They wanted to “destroy” our market, “grab” its land for other purposes, “sanitise” its offer, and even “get rid of” all its traders. Despite the City’s extremely high credentials for City planning and activation, the sceptics questioned their intent. Elon Musk tweeted on Christmas Eve - “So strange that people often believe things inversely proportionate to the evidence. Given a set of possible explanations, why pick the extremely unlikely one! ?” It is curious that extreme explanations gather so much traction although much of it can be put down to those who believe that the only real news is whatever they want others to believe. It can pay to be sceptical but maybe it needs to be directed at the intent of the sceptics rather than, in the case of QVM, the more likely explanation, of protecting a city landmark. Crowd in K Shed during extended trading on Friday before New Year. Taken at 3:00pm, the normal closing time. The Friday before Christmas (22nd December) and the Friday before New Year (29th December) were identified for extended trading in the Specialty Merchandise upper market but traders are suggesting we need to do a better job of responding to these occasions. The extension from 3:00pm closing to 5:00pm closing made sense in view of the special occasions of Christmas and New Year. The Friday before Christmas provided a useful sales boost after 3:00pm for a number of traders with one reporting that he achieved an extra 60% sales during the extension. Better Communication – hours were published on the QVM website and each trader given a copy of the trading calendar but maybe an SMS on the morning of the extended trading day would assist uniform trading. A couple of traders said they simply responded to their normal trading patterns and forgot about the extended hours. They felt that the normal trader/management communication process was lacking over the Christmas/New Year break. Stop Boxes In Aisles – there will always be occasions where traders need to pack early or set up late but the bottom line is that they shouldn’t inconvenience their neighbours or disrupt customer flow. It is theoretically possible to conduct all packing and unpacking within a stall’s boundaries. For packing convenience we use the aisles to locate boxes during those times. Maybe it is time every trader found a way to pack and unpack without using customer traffic areas. Putting sales and the customer first is not a bad philosophy. Old Habits Die Hard – The observation was made by a few traders that it is the older traders who are the culprits here and maybe we all need to look at better ways of operating our businesses. Penalties for Offenders – should traders who ignore the common good be penalised for their actions? This is not an issue that we are going to fix overnight and a knee-jerk reaction is not appropriate, but maybe with more publicity, better communication, and some serious discussion with those traders who have a problem, we can get it better on every occasion that extended trading hours are applied. There are two important points here. Firstly, consumers are telling us they want us to be more flexible and secondly, in tough times we need every sale we can get. 31/12/2017 18:29:52 EXTENDED HOURS "Most S M traders had a very poor lead up to Christmas (which is the norm only at the QVM) no matter how many hours you extend trading. Thank goodness that we had interstate and regional tourists who were in Melbourne after Christmas because they tend to be our real customers who actually spend money and not just people who come in to walk around. As we know massive crowds does not equal massive takings." Interstate and regional tourists are very important to most of us. Extending hours is probably not about huge changes but when we do decide to extend (as we did for the last two Fridays this year) it is important that all traders join the plan. The picture taken at 3:00pm last Friday shows that there is certainly potential for sales. Converting potential to reality is something else as you point out. When there are crowds around we all need to be primed for whatever eventuates. Thanks for your input. - Ed. It may surprise some observers to learn that a number of QVM Market Traders also engage in global financial markets particularly through the ASX. We thought it might be useful to look at the latest buzzword - crypto currencies. There are some legends amongst our ranks who have been very successful in trading shares over the years including the matriarch of one family business and one trader who came to the market straight from high school. It may just be in my circle of market neighbours but no Saturday discussion is complete without exchanging tips on the latest ASX market moves. The connection between trading goods and trading shares is not so distant. Both involve ways of making money, both include an element of gambling, and both need astute judgement. Market trading (QVM style) involves fluctuating levels of cash as we work through seasons and buying cycles. When you have waiting cash you like it to earn well and there are more profitable ways than storing it in a standard bank account. There is another element right now and that is that retailing is going through difficult times. Looking for other ways to earn income has become a necessity. Share trading can be profitable, but has its risks, and as we have already identified that is part of the buzz. Crypto currencies are a whole new thing in financial markets. They are described as digital currencies, alternative currencies, or virtual currencies, and Bitcoin is probably the best known. 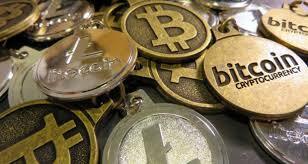 Bitcoin is described as a way of conducting transactions without a central bank. Transactions take place between users directly with a register called a blockchain keeping track of things. The wikipedia entry for bitcoin includes the warning that the description may be too technical for most readers to understand. Lord Mayor Doyle’s Dilemma – given Robert Doyle’s high profile within the city and particularly with QVM matters it is little wonder that his standing-down has attracted some discussion under the sheds. One trader commented that the city gets another tick for professionalism with its swift action to address the claims of sexual misconduct. Even the top man is subject to open scrutiny. Friday Crowds – were described as the lowest pre-Christmas crowds in memory as the horrific events in Flinders St. on Thursday impacted on shopper visitation to the city. 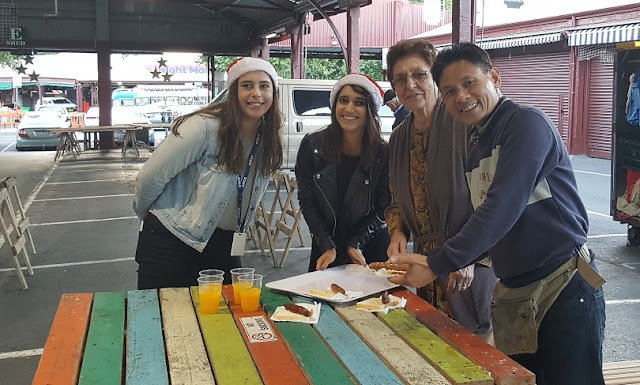 Big Congratulations - to the team at Vic Market Gifts for being voted best Christmas Display by market customers and winning the market’s “Deck The Stalls” competition. A Full Car Park – at 7am on Saturday morning was a joy to behold as the Christmas rush took hold. 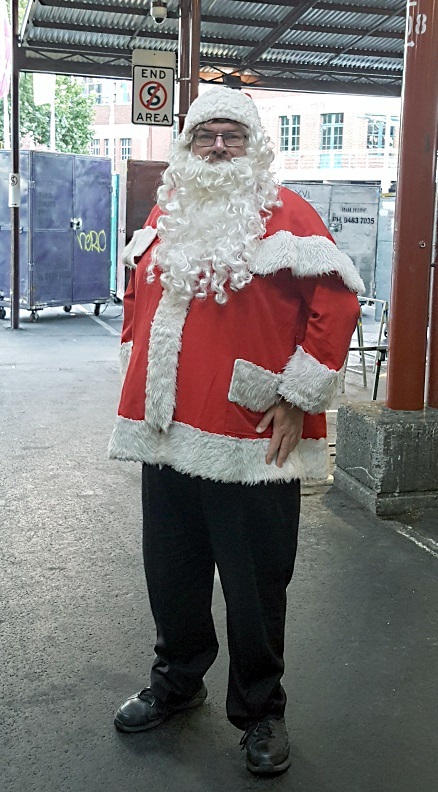 Boxing Day Trading Or Not – Victraders received a message from a trader asking why we were not opening on one of the biggest trading days of the year – Boxing Day. Traditionally we close on Boxing Day while the city is full of bargain hunting shoppers. One trader expressed the view that Boxing Day was always about the attraction of huge price reductions as major retailers cleared stock while market traders have bargain prices all year round, so the one day event has little relevance. And of course few people are thinking about food purchases so soon after Christmas. Do we need to reconsider? 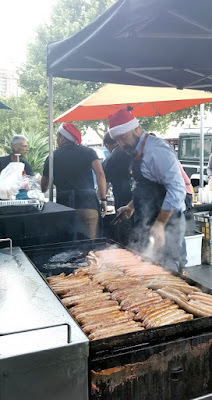 Night Market Booms – the last Wednesday night before Christmas attracted some good business for many Specialty Merchandise participants. 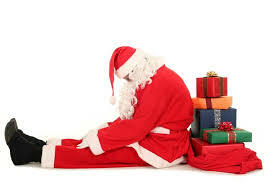 Christmas with sales exceeding pre-Christmas in some years. In this gloriously unpredictable world of retailing – what will happen in the remaining trading days of December and the first weeks of January? Fingers crossed for good trading. Thirty Two Things To Get Your Mind Off Politics And Business. This is a list of facts designed to clear your mind of side issues like politics and the state of business. 7. A 2" X 4" Stud is really 1-1/2" by 3-1/2". 8. During the chariot scene in 'Ben Hur,' a small red car can be seen in the distance (and Heston's wearing a watch). 13. There are no words in the dictionary that rhyme with orange, purple and silver.14. The name 'Wendy' was made up for the book Peter Pan. There was never a recorded 'Wendy' before. Thank you to the traders who contributed to this Christmas video and we echo their thoughts to all traders, staff, and customers. Anti-renewal Protest 1 – we understand that anti-renewal organisers wanted to park their truck across the top of Therry St. on Saturday morning but were denied by police and ended up in the kerb adjacent to the old Mercat Cross Hotel. Anti-renewal Protest 2 – according to one observer the crowd was around 300-400 at best which was well down on the organisers hoped for 5,000. A couple of traders have suggested that the public are smart enough to know when change is needed at QVM. Anti-renewal Protest 3 – we heard that the anti group handed out awards to three traders on Saturday morning for their efforts in resisting renewal. Leah Moore, Alby Renwood and Jenny Pyke were reported to be recipients. Provocative Action? – one trader claims that the decision to place traders in new positions down on the Therry St plaza on the the day of protest was provocative while another applauded management for at last showing some street smarts. A Trader has claimed discrimination saying that his free sausage on Friday morning only had tomato sauce, while his neighbour had tomato sauce and mustard. Come on management, equal treatment for all. What is the relevance of this platter of Paella? 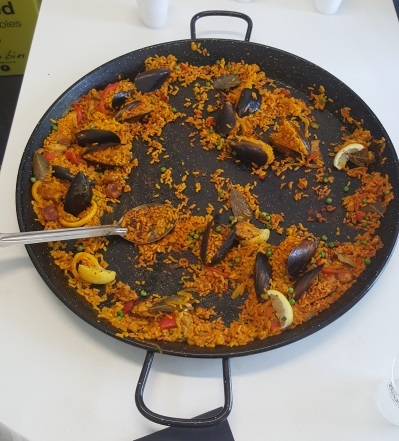 It was served up after the completion of the Social Media workshop on Monday and the almost empty platter suggests that a good appetite was built up by the participants. We hasten to add that the business discussion continued while the Paella was eaten. All agreed that this was a productive session and a follow up is planned where traders can compare progress on their social media programs. Great Ads – one trader has pointed out that the gift buying ads placed by QVM on social media are the most professional he has seen in a while. Why can’t we put quality hand crafted goods together asks one trader. Not even the Night Market is immune from retail downturn according to one participant who was happy with results up until this week. The free market bag promotion has been well received. There is nothing like a freebie to generate customer action and the hessian bag giveaway appears to be of good quality. Shame we ran out of customer vouchers. 20/12/2017 23:06:13 Christmas greetings "Greg thank you for the victraders news throughout the year it keeps us all informed, Merry Christmas and a happy new year thanks." Is This The Final Word On “Specialty Merchandise”. After an intense lobbying campaign on Victraders to change the term “General Merchandise” to “Specialty Merchandise” we might have the official tick from the very top. We think that pretty much locks it in. 18/12/2017 16:35:18 Final say on specialty merchandise "Perhaps given the current climate at QVM we could refer to the section as ‘tenacious traders’"
We are certainly that - Ed. 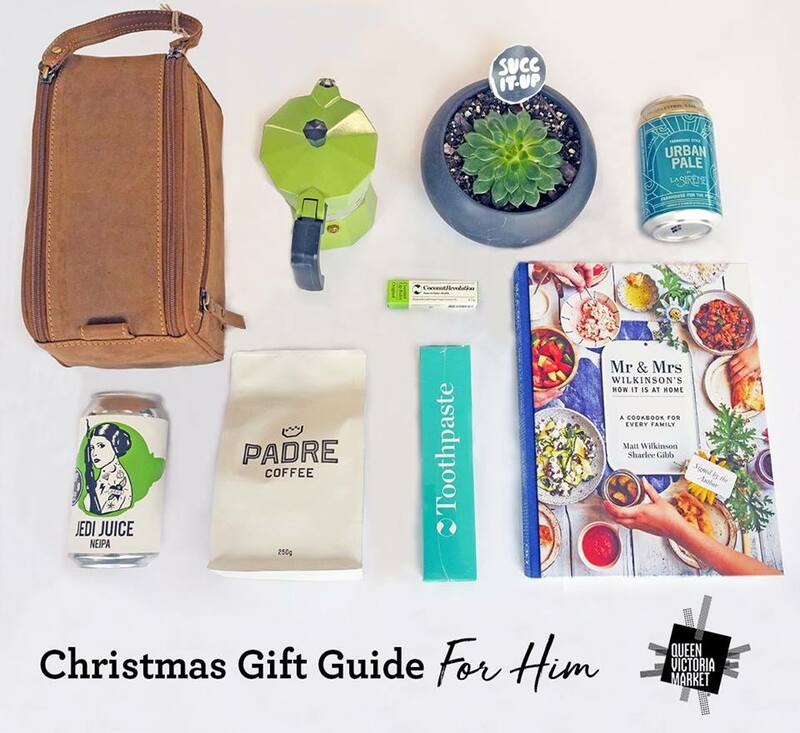 If you haven't started your Christmas shopping yet don't worry – seven artisan pop-up shops have just opened at the Queen Victoria Market to make the yuletide retail nightmare a lot more bearable. Along the Therry Street and Victoria Street strips is where you'll notice the new addition to the Vic Market. Social Media Engagement has become one of the essentials of modern retailing. A number of QVM traders operate business Facebook pages and Instagram accounts but few know how to maximise their effectiveness and Marianne Mewett’s presentation at the Engagement Centre on Monday has put attendees on the right track. This presentation was equally relevant to traders with no social media experience or those with some experience. The former group will probably want to follow up with one-on-one sessions under the Marketing Cooperative Program but current users will have left this workshop with the tools to prepare a regular schedule of social media posting and draw sales benefit from this type of customer engagement. - The importance of good photographs and videos. - Posting once per day. - Sales focus – specials, deals, and freebies attract responses. - Link all your channels including your website. Marianne has produced a document highlighting some of the key points and providing advice for new starters. We have put a special link at the top of this page (SocialMedia How To) which you can access at anytime. Social Media Engagement is a whole new world for many traders but it has growing acceptance in the retail industry and is quite easy to implement. A daily post needs just a few minutes of spare time while at your stall and a few basic photo taking and typing skills. Any queries can be directed to the QVM marketing staff. Why not start the ball rolling now. It can be difficult to get a true assessment of retail performance around Christmas as marketing hype is fed out to consumers but the cold hard reality of the Australian share market paints a very clear picture, and it is not good. Myer's share price fell by nearly 10% on Thursday following the announcement that their Christmas sales in the first two weeks of December were down 5%. The second worst performer on the ASX 300 that day was Accent Corporation (footwear group for brands like Vans, Skechers, and Dr.Martens) with a 7.4% share price drop. The share price of both retailers has fallen more than 40% over the last 12 months. In the top 10 worst performers on the ASX300 for the year, four were retailers - RFG Corp (Gloria Jeans, Brumbys, Donut King), Myer, Thorn Group (Radio Rentals), and Vita Group (mobile phones). Clearly there is a lot more to retail decline than any local trading conditions. This is an Australia wide (if not global) retail phenomena. 1. RFG says complaints over franchise fees un-founded. 2. Australian lifestyle brand, The 5th, opens pop-up store in New York. 3. Oroton asks for more time to sell business. 4. BP allows you to pay for petrol through app without leaving car. 5. Australian farm production to fall 7% due poor rain. 6. Lowy’s sells its Westfield international shopping centre empire for $32.7b. 7. Melbourne airport opens new luxury shopping precinct including Tiffany’s and Burberry’s. 8. Sorbent toilet paper group issues profit warning. 9. Myer issues another profit warning and shares plunge. 10. ACCC knocks back BP’s bid for Woolworth’s petrol stations. 11. Stocklands gets approval for $830m shopping centre on Sunshine Coast. 12. Australian Specialty retailers increase sales but drop margins. 13. Uniqlo plans expansion of semi-made-to-order clothing. 14. UBS cuts consumer outlook for next 2 years following increased household expenditure, and low income growth. 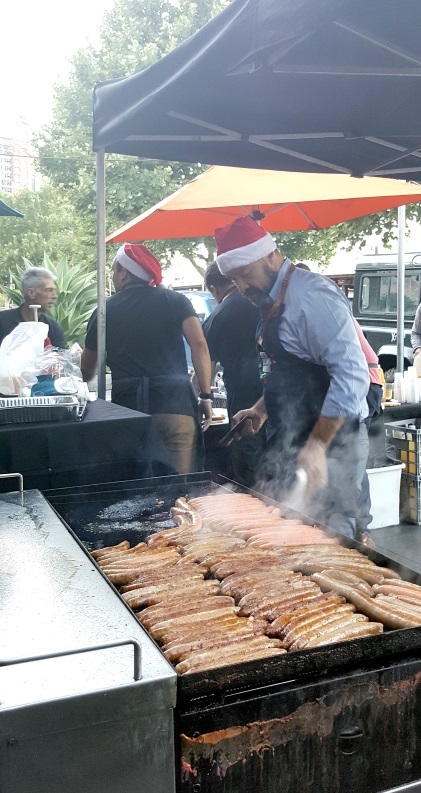 Friday's early morning BBQ cook by members of QVM management got the thumbs up from traders particularly those who had food delivered to their stalls. The sausages ran out about 7:30 so, if you missed out you might need to put a note in your diary for next year. Here are some photos. Spiros cooks up a storm. Every BBQ needs a supervisor or three. Traders were grateful for the personal delivery from friendly office staff. Traders queue for a sausage. Is Your Photo In This New Market Book?